Louis the Pious (778-840) - The son and successor of Charlemagne who ruled the Franks from the time of his father's death in 814 (actually his father appointed him co-emperor in 813) until his own death in 840 (save for a year from 833 to 34 when he was temporarily deposed). His first title was King of Aquitaine which he was named in 781 at the age of only three. As King of Aquitaine, when he came of age, he was charged with the defense of his father's southern border. Likewise, he had an older brother, Pepin, who was made King of Italy. When Pepin died in 810, rather than revert back to Charlemagne or go to Louis, the crown was passed on to Pepin's son, Bernard. So when he took over the throne in 814, he inherited Charlemagne's entire kingdom, with the exception of Italy. This scenario led to one of the most significant events of Louis' reign. As nephew of the emperor, Bernard was considered a subordinate, and Italy was expected to be a vassal state under Frankish authority. Bernard feared Italy would be absorbed back into the kingdom and passed on to one of Louis' sons. So he began making plans to sever ties with the Frankish Empire and declare total independence. When Louis heard of this, he quickly raised an army and marched on Italy in 818. Bernard was not expecting such a swift response and chose to surrender rather than fight. He was tried for treason and sentenced to death. However, Louis commuted his sentence to blinding instead. The process consisted of poking the eyes with a red hot iron. Bernard barely survived the ordeal and ended up dying anyway two days later, after suffering from intense pain. The event would plague Louis' conscience for the rest of his life, and he did public penance to assuage his guilt. 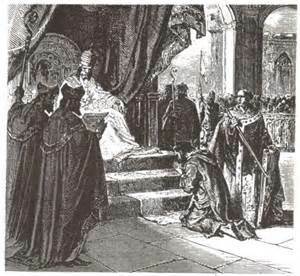 Now all of Charlemagne's kingdom was once again under the control of a single emperor. The unification would not last long, however. Upon Louis' death in 840, his three surviving sons fought over the empire, which resulted in its eventual partition (see Treaty of Verdun).